The fabric is a very, very nice quality 100% cotton (batiste weight) with the real-deal Swiss dots scattered throughout. And just $9.99 py! Using my 50% off coupon makes it $5 py now, and I am loving it even more. It was a surprise to find this at JoAnn’s. Some time ago, my daughter called me a textile snob and in all honesty I have to plead guilty as charged. Most of the fabric I use has been purchased at Farmhouse Fabrics, Martha Pullen Company or other quality, upscale fabric retailers. So when I found this sweet piece at JoAnn’s, I was taken aback. 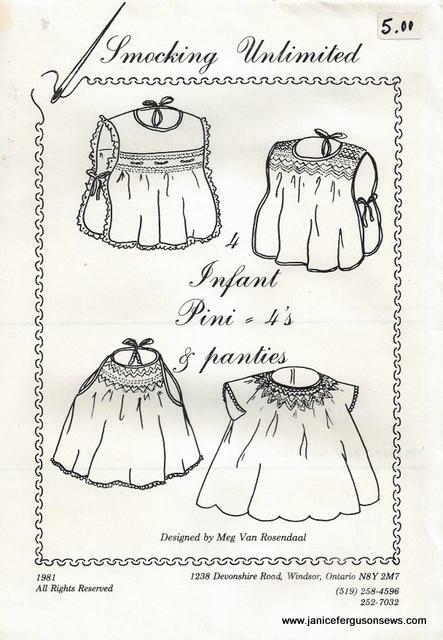 But since Judy Day bought that lovely “Lisette” satin finish cotton at JoAnn’s for her granddaughters’ Easter dresses, I’ve looked more closely at their fabrics. There are some real beauties available. The skirt back opening has an interesting modification. Instead of adding a placket, I simply faced the slit with lace tape. 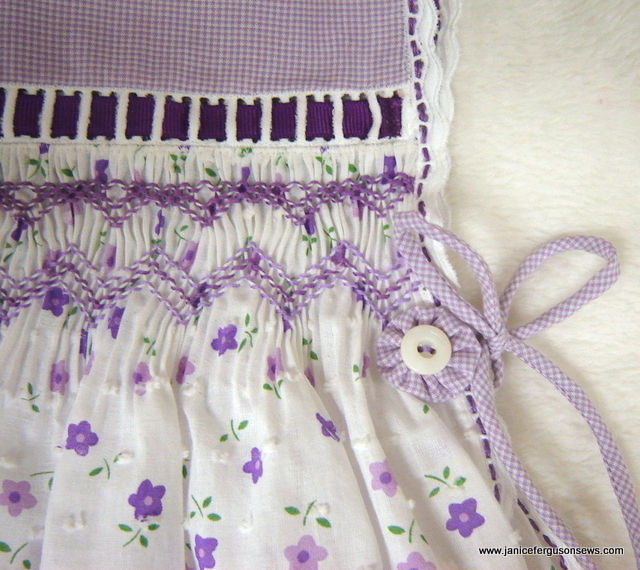 This is a neat, soft, no fuss finish which worked perfectly, allowing the smocking to come right up to the back opening. Swiss edging was joined around the perimeter of the pini-4 and at the legs. Embroidery floss was woven through the entredeux pattern, giving some visual weight to the white edging against the white background of the fabric. Where the ties attached, yo-yo’s covered the securing stitches. Pearl buttons are nestled in the center of the yo-yo’s for an extra embellishment. I’ve tried my best to accommodate my daughter’s request for ruffle bottom bloomers for Baby Girl’s outfits. Several methods of attachment have been tried and I’ve finally settled on this technique. The ruffles were rolled and whipped on my serger with wooly nylon in the upper looper. Then the gathering thread, run 1/2″ from the top edge, was pulled up. After extensive pinning, a small zig zag stitch L2 W1.5) was worked over the gathering thread to join the ruffle to the bloomer back. I really enjoyed making this little headband. On the crocheted elastic headband yardage purchased at–where else?–JoAnn’s, two yo-yo’s were stacked with a tiny purple button in the center. A short length of microcheck tubing was left over, so it was added to the mix. Of course, I can’t wait to see Vivian Rose wearing this. I hope her mama isn’t disappointed in the color. She told me early on that she didn’t care what color I made Baby’s clothes–light pink, dark pink, rosy pink, bright pink, pale, pale pink—well, you get the picture. Now I’m moving on, but to what I am not sure. Time for true confessions. I have fallen off the fabric diet wagon and purchased yardage of several gorgeous pieces. The one that is calling me is the Lisette print Judy used for her girls’ dresses. I think Laurel Cade will soon be wearing a gaily printed sundress. I’ll get started on that as soon as I put that row of purple cable below the beaded ribbon….sigh. Being compulsive is a real pain. UPDATE: I did it. Less than 18 hours after this post was put up, that much needed cable row has been added. Whew! Why did I fight it? Now I am much happier with the project. And now I am reeeeeeally moving on. 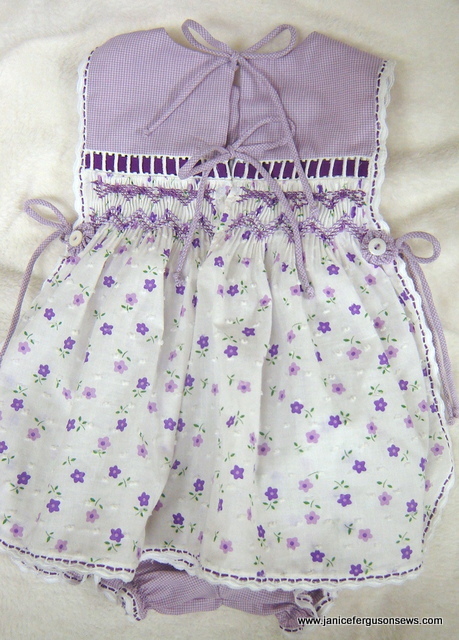 This entry was posted in hairbows, heirloom sewing, infant clothing, serger, smocking and tagged baby pinafore, baby sundress, heirloom sewing, ruffled bloomers, smocking, yo-yo's. Bookmark the permalink. It’s really lovely, Janice! And that cable row won’t take you two shakes of a lamb’s tail! That is positively beautiful!!! This is one of my favorites of yours. 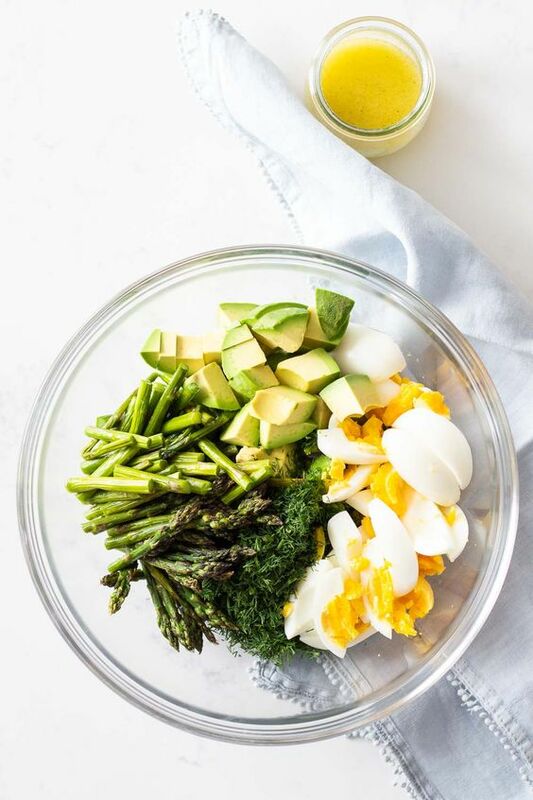 I think your dd will love this too! I just love all the little details! This is really a cute outfit! and I love the colors. I hope you post a photo of the baby in it soon. 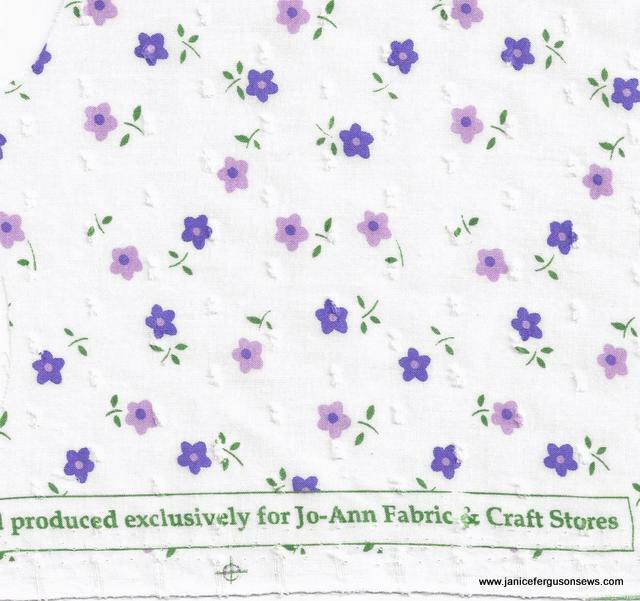 I’ll have to look more closely at Joann’s, that is just beautiful fabric. So cute! I love your use of the wide insertion & the edge trim. Such a great way to make the pini a one of a kind design. Thanks, Jo. You were right–those cables took very little time and I am so much happier with the pini-4. Thank you, Angela. I was a little concerned that it was looking cluttered, so I did no embroidery on the yoke. That, I think, would have been just too much. Oh, Debby, Vivian Rose does not need pretty clothes to be the talk of the town. With her big toothless grin and friendly personality, people in the grocery store just gravitate to her. Thanks, though, for the compliments. Thanks, Cynthia. Next week the whole family is coming for a long-overdue visit. So I will have this on Baby Girl and take pictures–if I can catch her. She’s crawling at warp speed now and all this activity seems to be reducing her chubbaliciousness. Do take a closer look at Joann’s. I’d rather support a local smocking/heirloom shop, but I can do that only when I am out of town. Other than a quilt shop and WalMart, Joann’s is the only fabric store within 40 miles of my home. Of course, I buy a lot on-line from Farmhouse Fabrics. Beckie, I am trying so hard to make a dent in my stash of heirloom goods. This didn’t use a lot of yardage, but I think it added nice touches to the outfit. Janice, the pinafore is just lovely! 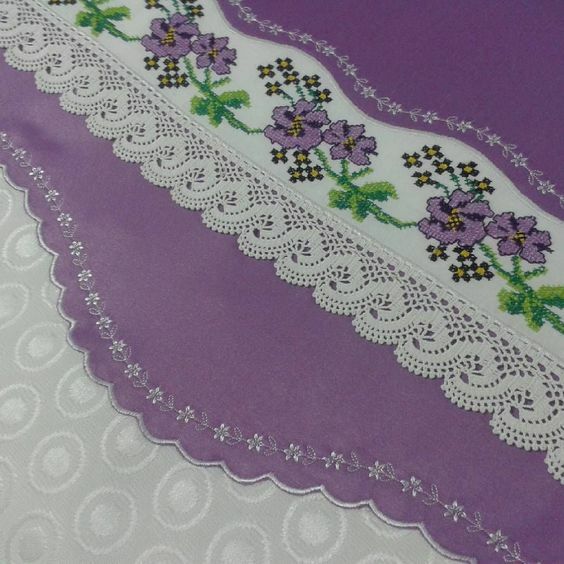 The lavenders and purples, Swiss trim, yo-yo flowers,ruffles, buttons, etc. 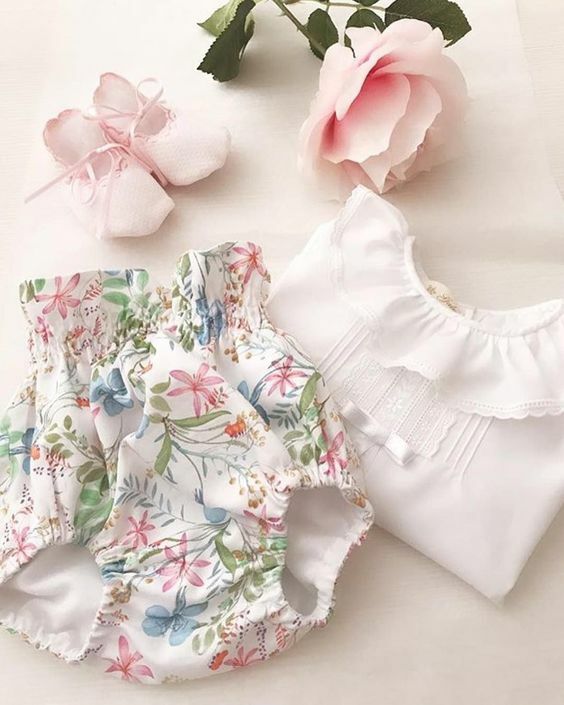 together make the sweetest and most feminine of little outfits. I am looking forward to seeing this on Miss Vivian Rose! Thanks, Karen. As I worked on it, I was a little concerned that it was getting cluttered, but I am pleased with it. I am glad I refrained from putting some embroidery on the bodice. That would have been too much, I think. Lovely details, Janice. I agree that not everything at the big fabric retailers is quality but every so often you hit the jackpot. 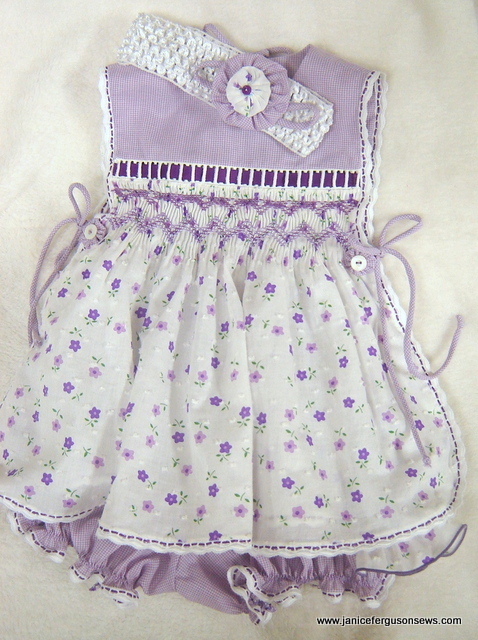 The details on this pinafore are lovely, as always. Thank you, Claire. I rarely plan the details of a project. They just seem to demand to be included, making it quite exciting to see just how it turns out. I love this little outfit. 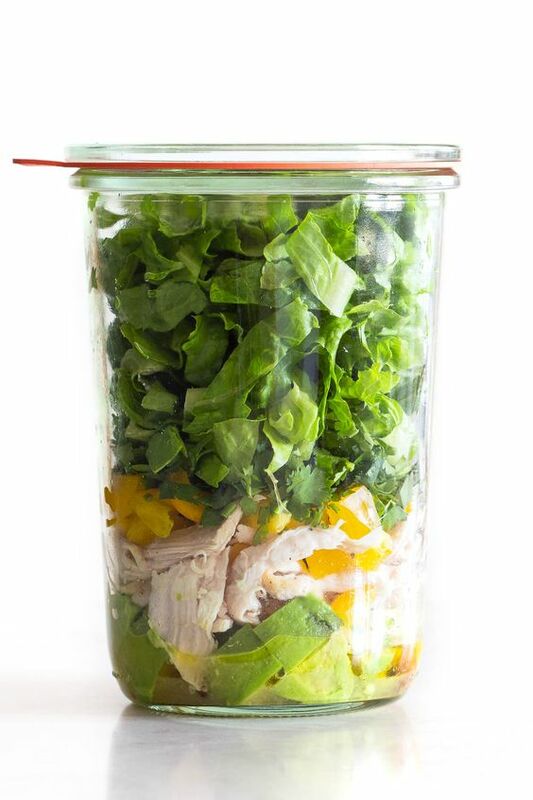 It looks like a fun pattern to do. Your work is so lovely, Janice. I love this beautiful outfit. You did a wonderful job! Can you tell where I can find the pattern or where I can order? Thanks for your kind words about this little outfit.The pattern, Pini-4’s by Smocking Unlimited, is out of print. But Lisa, at Mommy’s Apron Strings is about ready to release a very similar (and in a few ways better) pattern. Check her site and see the darling versions she has come up with.